Comfortable apartment in Torredembarra, less than 3-4 minutes walk distance from the great extension beach La Paella, awarded with the Blue Flag for its excellent services and facilities of all kinds: showers, daily cleaning of the beach, beach promenade, beach police, sunshades and sun loungers rental... Its fine golden sand has a soft entry to the sea, which makes it very safe and suitable for children. Also very close to the city center, supermarkets, shops, cafes, bars, restaurants, pharmacy, bus and train station. It has 1 double bedroom with double bed and wardrobe, living room with sofa bed, air conditioning and access to the terrace. Bathroom, kitchen, washing machine, fridge, coffee machine, microwave. 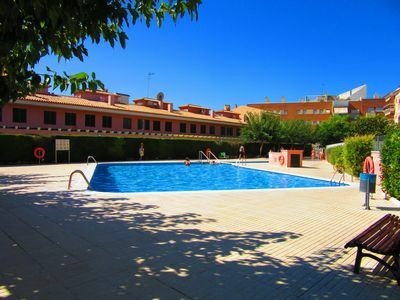 The guests have access to a communal pool 30 m away from the apartment. It’s situated on the first floor with elevator. Capacity 4 people, pets not allowed.